"This Cuban sandwich is piled high with ham, roast pork loin, Swiss cheese, and dill pickles, then toasted to warm and crunchy perfection." Combine mayonnaise, sour cream, cilantro, green onions, ground chipotle peppers, lime juice, garlic basil spread, cumin, salt, and black pepper in a small bowl. Stir until combined. Cover and refrigerate for at least 1 hour. Heat olive oil in large skillet over medium-high heat. Stir onions, red pepper flakes, and oregano in the hot oil until onions begin to soften, about 5 minutes. Season with salt and ground black pepper to taste. Add half the jalapeno pepper rings and cook until they begin to soften, 2 to 3 minutes. Reserve remaining jalapeno rings. Spread each ciabatta roll with 1 tablespoon sweet hot mustard and 2 tablespoons chipotle mayonnaise. Evenly divide the Swiss cheese slices, slices of pork loin, ham, dill pickles, and remaining jalapeno rings among the four sandwiches. Top with cooked onion mixture. Place sandwiches onto a baking sheet and bake in the preheated oven until cheese is melted and bread is toasted and warm, 4 to 5 minutes. See how to make a Cuban-style pork sandwich. 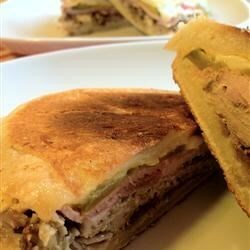 Excellent recipe for a Cuban sandwich. I subbed my own homemade cuban rolls for the ciabatta and grilled/pressed the sandwiches, which is traditional, rather than baking. Not a traditional Cubano but a good sandwich none-the-less. Only changes were that I used Cuban bread rather than ciabatta rolls and I pressed sandwiches rather than baking them. So so good!! My husband and I loved these! I even made mine on gf bread and they were still super tasty! Really simple and really tasty. Made it for the kids on movie night and they enjoyed the meal without making a mess - great alternative to pizza.